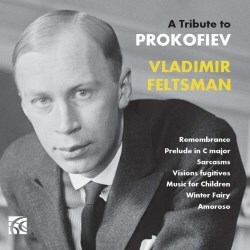 Vladimir Feltsman’s latest recording is entitled, ‘A Tribute to Prokofiev’ and it explores Prokofiev’s intimate and lyrical gifts as a composer through the medium of his piano miniatures. All the works in the recording are short and range from under 1 minute to 5 minutes in length. In the opening Remembrance, Feltsman artfully layers Prokofiev’s textures subtly bringing out inner voices. In the ‘Harp’ Prelude the light crystalline outer sections contrast beautifully with the spiky material in the central section. Prokofiev’s 5 Sarcasms show the composer flexing his modernist muscles with their harsh, biting rhythms and polytonal harmonies. In the quicker movements Feltsman delivers the work’s pugnacious hammer blows with vehemence without breaking the tone while at the same time sustaining the melodic line. The slower movements have an introspective meditative feel and Feltsman evokes some imaginative veiled sonorities. Feltsman’s tempi are a little slow – a point which he acknowledges himself in the programme's notes: “Most of the works in this recording are played in moderate tempos, a bit slower than usual, in order make the textures of each work clear and apparent”. While the intention is laudable, some of the pieces could have benefited from quicker tempi in order to convey the composer’s distinctive rhythmic bite. Prokofiev’s Vision Fugitives were written 5 years after the Sarcasms and the collection is a considerable advance on the earlier work. The title of the work was inspired by the following lines from the symbolist poet, Konstantin Balmont: “In every fleeting vision I see worlds. Filled with the fickle play of rainbows”. While writing Visions Prokofiev had come under the spell of Debussy and many of the short pieces show the influence of the French impressionistic style. Feltsman characterises these short pieces beautifully and I was impressed with the way in which he was able to immerse the listener so completely in the distinctive sound world of each piece. We move from meandering chordal patterns to playful animation, sparkling fair-tale music to pastoral vignettes, and from comic interludes to barbarous ferocity. Once again Feltsman’s tempi are a little slow: this approach perhaps pays more dividends with these miniatures in that it allows him more space to bring out the distinctive character of some of the pieces. Having said that I would have liked to hear more of the raw visceral energy that one encounters in other recordings of this work. The Music for Children is not performed in the concert hall very often although many of these pieces have a distinctive charm. Feltsman plays them with a high degree of finish and without any trace of condescension. Lyrical interludes and expressions of regret vie with more rhythmically boisterous music in an affecting way. The recording concludes with two of Prokofiev’s dances from Cinderella. In the Winter Fairy, Feltsman evinces a rich shimmering backdrop against the mesmeric dance like figurations. The Amoroso which concludes the recording starts off well although Feltsman makes heavy weather of the rippling piano figurations and I would have welcomed a lighter, less ponderous touch. It is difficult to make comparisons with other artists as many pianists record individual pieces rather the complete sets recorded here. Steven Osborne has recorded Sarcasms and Visions Fugitives while Richter has also recorded selections of pieces from the Visions. Feltsman compares reasonably well with these artists and shows an excellent musical understanding of the works although I did have some reservations with his performance for the reasons outlined above. Overall, there is much fine playing on this disc and it is highly recommended.